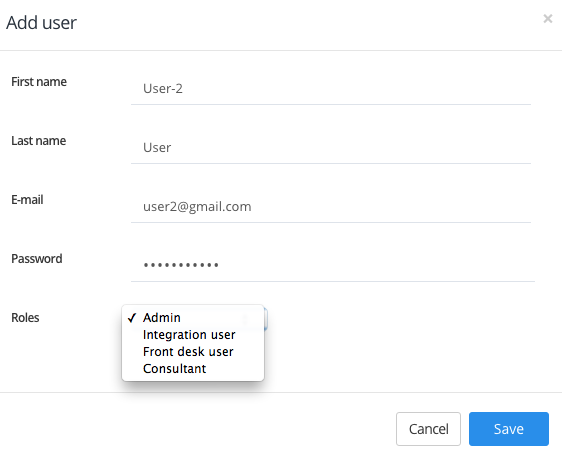 You can add multiple users for your HotelRunner account. Please go to the My Property / Account / Users / Add User sections respectively from the upper menu of HotelRunner extranet. Over the pop-up window please enter the details of new user, assign a role and then click Save to register the new user on the system. Full access: May use the entire extranet and perform any operation. Consultant: May access to anywhere on the extranet except for the details of your guests. Front desk user: May access to the reservations section only and view the details of the guests. Calendar access only: May use the calendar only.